Jewish children and their parents enjoy a bonfire in celebration of Lag B’Omer last year in Poland. With unity parades, rallies, bonfires and barbeques, Jewish communities around the world are planning to celebrate the fast-approaching holiday of Lag B’Omer on a grand scale. In the north of Israel, hundreds of thousands of people will ascend the mountain of Meron Saturday night to gather at the resting place of Rabbi Shimon bar Yochai, the second-century mystical sage who’s passing the day commemorates, while in New York City, thousands of Jewish children will parade down Brooklyn’s Eastern Parkway Sunday morning. For Rabbi Yaakov Tzvi Kantor and his community at the Chabad-Lubavitch Jewish Center of Greater Lugano, Lag B’Omer is the perfect chance for the small, but vibrant collection of Jewish families in that part of Switzerland to enjoy a lakefront barbeque, mini-golf tournament and go-kart adventure. “For some people in our community of about 300, this will be their first time celebrating Lag B’Omer,” says Kantor, who moved to this Italian-speaking town two years ago. “It’s a chance for them to learn about the holiday and its meaning. Always occurring 33 days after the beginning of Passover, Lag B’Omer gets its festive nature from bar Yochai, whose mystical teachings form the body of the foundational text of Kabbalah known as the Zohar. Before his passing, he instructed his students to celebrate the day as heralding the dissemination of the Torah’s esoteric wisdom. Rabbi Arie Zeev Raskin estimates that about 250 people will attend the weekend event, which will take over the Dreamland park near the city and will include a barbeque, bonfire, live music, dancing and family-friendly activities. 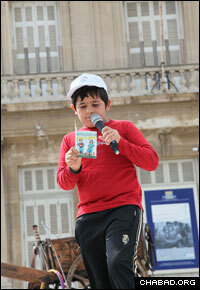 Chabad Houses in Marseille, France, put on a children’s rally for last year’s Lag B’Omer festivities. Jews in Finland will likewise celebrate Lag B’Omer with a communal beachfront barbeque. Rabbi Binyamin Wolff, co-director of Lubavitch of Finland, says that he expects 300 people for the event, which will also unofficially usher in the beginning of spring in that part of the world. For Chabad.org’s full directory of events taking place in your area, click here. In South Africa and Canada, communities are planning parades for thousands of people. The last time Lag B’Omer fell out on a Sunday, such parades in Cape Town and Toronto drew about 5,000 guests each. And at the Chabad House of Uruguay, Jewish locals in Montevideo are putting the final touches on a slightly different kind of celebration. Current plans call for 25 carloads to take people throughout the city on a treasure hunt ending in a barbeque and bonfire. The winners will get four tickets for a vacation in Buenos Aires, Argentina.